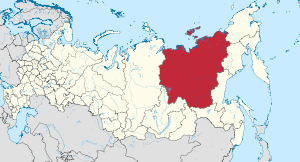 The Sakha (Yakutie) Republic (Roushie: Республика Саха (Якутия); Sakha: Саха Республиката, Sakha Respublikata) is a federal subject o Roushie (a republic). Population: 958,291 (2010 Census), consistin mainly o ethnic Yakuts an Roushies. Comprisin hauf o the Far Eastren Federal Destrict, it is the lairgest subnaitional govrening body bi aurie in the warld at 3,103,200 km2 (1,198,200 sq mi) (juist smawer than Indie which covers an aurie o 3,287,240 km2). It haes a population o fewer than ane million inhabitants. Its caipital is the ceety o Yakutsk. Afore the arrival o the Roushie Empire, the majority o the local population believed in Tengrianism common tae Turkic-leid fowk o Central Asie, or in Paleoasie indigenous shamanism wi baith 'licht' (community leadin) an 'daurk' (healin through spirit journey) shamans. Unner the Roushies, the local population wis convertit tae the Roushie Orthodox Kirk an required tae tak Orthodox Christian names, but in practice generally continued tae follae traditional releegions. Durin the Soviet era, maist or aw o the shamen dee'd athoot successors. Currently, while Orthodox Christianity maintains a follaein (housomeivver, wi vera few priests willin tae be stationed ootside o Yakutsk), there is interest an activity toward renewin the traditional releegions. As o 2008, Orthodox leaders describit the warld view o the republic's indigenous population (or, rather, those amang the population who are no completely indifferent tae releegion) as dvoyeverie (dual belief seestem), or a "tendency toward syncretism", as evidencit bi the locals sometimes first invitin a shaman, an then an Orthodox priest tae carry oot their rites in connection wi some event in their life. internal: Chukotka Autonomous Okrug (E), Magadan Oblast (E/SE), Khabarovsk Krai (SE), Amur Oblast (S), zabaykalsky Krai (S), Irkutsk Oblast (S/SW), Krasnoyarsk Krai (W). watter: Airctic Ocean (includin Laptev Sea an Eastren Siberie Sea) (N). Sakha stretches tae the Henrietta Islands in the far north an is washed bi the Laptev an Eastren Siberie Seas o the Airctic Ocean. These watters, the cauldest an iciest o aw seas in the northren hemisphere, are covered bi ice for 9–10 months o the year. New Siberie Islands are a pairt o the republic's territory. Efter Nunavut wis separatit frae Canadae's Northwast Territories, Sakha became the lairgest subnaitional entity (statoid) in the warld, wi an aurie o 3,103,200 square kilometres (1,198,200 sq mi), slichtly smawer than the territory o Indie (3.3 million km²). Sakha can be dividit intae three great vegetation belts. Aboot 40% o Sakha lees abuin the Airctic circle an aw o it is covered bi permafrost which greatly influences the region's ecology an limits forests in the soothren region. Airctic an subairctic tundra define the middle region, where lichen an moss grow as great green carpets an are favorite pasturs for reindeer. In the soothren pairt o the tundra belt, scattered staunds o dwarf Siberie pine an larch grow alang the rivers. Belaw the tundra is the vast taiga forest region. Larch trees dominate in the north an staunds o fir an pine begin tae appear in the sooth. Taiga forests cover aboot 47% o Sakha an amaist 90% o the cover is larch. The Sakha Republic is the steid o Pleistocene Pairk, a project directit at recreatin pleistocene tundra grasslands bi stimulatin the growth o grass wi the introduction o animals which thrivit in the region durin the late Pleistocene — early Holocene period. Yakutsk Time Zone (YAKT, UTC+10). Covers the republic's territory tae the wast o the Lena River as well as the territories o uluses locatit on the baith sides o the Lena River. Vladivostok Time Zone (VLAT, UTC+11). Covers maist o the republic's territory locatit atween 127°E an 140°E langitude. Magadan Time Zone (MAGT, UTC+12). Covers maist o the republic's territory locatit east o 140°E longitude. Sakha's greatest muntain range, the Verkhoyansk Range, runs parallel an east o the Lena River, formin a great airc that begins the Sea o Okhotsk an ends in the Laptev Sea. The Chersky Range runs east o the Verkhoyansk Range an haes the heichest peak in Sakha, Peak Pobeda (3,003 m). Recent satellite photos, housomeivver, revealed that Peak Mus-Khaya mey in fact be a heicher point, reachin 3,011 m.
The Stanovoi Range borders Sakha in the sooth. Sakha is well endoued wi raw materials. The soil contains lairge reserves o ile, gas, coal, diamonds, gowd, siller, tin, tungsten an mony ithers. 99% o aw Roushie diamonds are mined in Sakha, accoontin for ower 25% o the warld's diamond production. Sakha is kent for its climate extremes, wi the Verkhoyansk Range being the cauldest aurie in the northren hemisphere. Winters here are extremely cauld. Some o the lawest natural temperaturs iver recordit hae been here. The Northren Hemisphere's Pole o Cauld is at Verkhoyansk, whaur the temperaturs reached as law as −67.8 °C (−90.0 °F) in 1892, an at Oymyakon, whaur the temperaturs reached as law as −71.2 °C (−96.2 °F) in 1926. Average Januar temperatur: −28 °C (−18 °F) (coast) tae −47 °C (−53 °F) (Pole o Cauld). Average Julie temperatur: +2 °C (36 °F) (coast) tae +19 °C (66 °F) (central pairts). Housomeivver, it gets vera hot durin the day in Yakutsk in Julie (record = +38.3 °C (100.9 °F)). Average annual precipitation: 200 mm (central pairts) tae 700 mm (muntains o Eastren Sakha). The offeecial leids are baith Roushie an Sakha, an aw kent as Yakut, which is spoken bi approximately 25% o the population. The Yakut leid is Turkic wi Mongolie influence an some borraeins frae Sakha's Paleosiberie indigenous fowks. ↑ Minahan, James (2002). Encyclopedia of the Stateless Nations: S-Z. Greenwood Publishing Group. pp. 1630ff. ↑ 7.0 7.1 7.2 Roushie Federal State Stateestics Service (2011). "Всероссийская перепись населения 2010 года. Том 1" [2010 Aw-Roushie Population Census, vol. 1]. Всероссийская перепись населения 2010 года (2010 Aw-Roushie Population Census) (in Roushie). Federal State Stateestics Service. Retrieved June 29, 2012. ↑ 9.0 9.1 9.2 Правительство Российской Федерации. Федеральный закон №107-ФЗ от 3 июня 2011 г. «Об исчислении времени», в ред. Федерального закона №271-ФЗ от 03 июля 2016 г. «О внесении изменений в Федеральный закон "Об исчислении времени"». Вступил в силу по истечении шестидесяти дней после дня официального опубликования (6 августа 2011 г.). Опубликован: "Российская газета", №120, 6 июня 2011 г. (Govrenment o the Roushie Federation. Federal Law #107-FZ of Juin 31, 2011 On Calculatin Time, as amended by the Federal Law #271-FZ of Julie 03, 2016 On Amendin Federal Law "On Calculatin Time". Effective as of efter saxty days follaein the day o the offeecial publication.). ↑ Елена Дятлова (Yelena Dyatlova) (October 1, 2008). "В Якутии господствует двоеверие (Ч. 1) (Yakutia is dominated by a dual belief system)". Во многих случаях нам говорили, что при совершении тех или иных обрядов или просто действий приглашают сначала шамана, потом священника. Правда, именно в таком порядке, признавая христианство чем-то высшим по отношению к местной магической языческой традиции, но это соединяя. Даже среди тех представителей якутской интеллигенции, с которыми мы общались, это стремление к синкретизму было отчетливо приметно. (An interview with Maxim Kozlov, a Moscow priest who had recently returned from a missionary trip down the Lena along with the Bishop of Yakutsk). 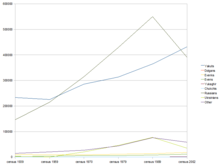 ↑ "National Composition of Population for Regions of the Russian Federation" (XLS). 2002 Russian All-Population Census. 2002. Retrieved July 20, 2006. Верховный Совет Республики Саха (Якутия). 4 апреля 1992 г. «Конституция (основной закон) Республики Саха (Якутия)», в ред. Конституционного закона №581-З 53-IV от 22 июля 2008 г. (Supreme Council of the Sakha (Yakutia) Republic. April 4, 1992 Constitution (Basic Law) of the Sakha (Yakutia) Republic, as amended by the Constitutional Law #581-Z 53-IV of July 22, 2008. ). Wikimedia Commons haes media relatit tae Sakha. This page wis last eeditit on 8 Mairch 2018, at 05:11.